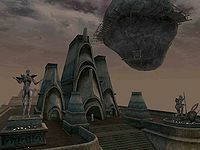 Vivec City (often shortened to simply Vivec), named after the god of the same name, was the largest city in Vvardenfell, once situated on its southern coast in a large lagoon. The city was a collection of nine artificial islands; each island was a separate district or canton and was made up of a large multi-tiered building the size of a small town. The many bridges and walkways between these cantons created a maze that could be intimidating for new arrivals. Water was the dominant element in the architecture, present even inside. The entire city of Vivec was considered a holy place, as it was home to the Living God Vivec himself. The city was policed by special guards drawn from the militant order of the Temple, the Ordinators. The first of these cantons from the Vivec landing on Vvardenfell's mainland was the Foreign Quarter, the entrance to Vivec. Originally, this was as far as outlanders were allowed into Vivec, although this law was repealed long before Vivec's destruction. 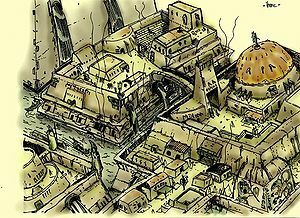 The Foreign Quarter housed the Mages and Fighters Guilds, a cornerclub containing the Thieves Guild, a small Imperial Cult shrine, a tomb, and many shops. It was also the largest canton in the whole of Vivec, having two Waistworks levels, once known as the Lower and Upper Waistworks. Due to Vivec's absence early in the Fourth Era, the Ministry of Truth finished its fall into the city of Vivec in 4E 5. The rock, resuming its previous velocity and trajectory, crashed into and destroyed Vivec city, which caused the eruption of Red Mountain in what is known as the Red Year. The area where Vivec's awe-inspiring cantons stood is now known as Scathing Bay because the rock opened up a fissure into an active underwater volcano. Esta página foi modificada pela última vez à(s) 15h22min de 5 de outubro de 2017.